There seemed to be a crispier and snappier crunch to these Crisps compared to others in the regular Asda range. The crunch was brittle because the Crisps were so thin, but the mush stage did appear later than some in the range. These Crisps were mostly thin and flat. There were very few oil boils. The very pale yellow of the Crisp surface featured a small amount of orange seasoning here and there. A Nose Plunge Test revealed the very slightest aroma of Bacon. There was definitely a Smoky taste, but the Bacon aspect of the partnership was weak. 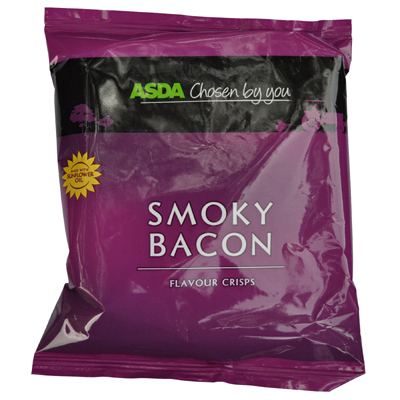 It always takes a stretch of the imagination to imagine any Bacon flavour Crisp actually tastes of Bacon, which somehow has less flavour, but these Crisps did feature a similarity with other Crisps of this variety.